I really love the tarot because it is interpretation of symbolism in art. 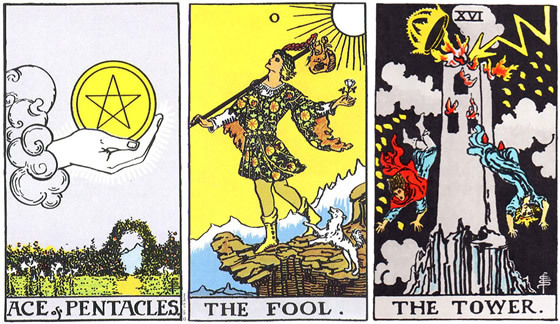 Learning more about tarot is a great way for artists to understand how to convey meaning. If a good opportunity comes your way, try not to make a foolish decision that turns everything into a big mess. With these 3 cards it looks to me that Uranus in Taurus is going to bring some surprises, financial changes, unexpected realizations, a shift in beliefs or understanding about money. A focus on changes in the material world. More physical earth changes are possible. Are you unclear of the consequences of your actions? Pay attention to the progress of karma this week. The outcomes will give you a shake up of perspective that could lead to a change in direction. If you're naive, or blind to facts, you may get a necessary reality check. What you thought you knew or believed about reality may not end up being the truth after all. These cards indicate that you may see different results than you may have expected from your efforts and hard work. If you're foolish or lazy and not taking smart, practical, orderly steps, you may end up overwhelmed by confusion and a lack of focus. Try not to make foolish decisions about money that will negatively impact your future. You could suddenly change your mind once you learn new information you hadn't considered before. You could have a revelation and see things in a different way even to the point where you have a major shift in your own identity. Whatever your personal, practical efforts are this week, they could bring you a new, different understanding that leads to a big and necessary change in how you proceed.